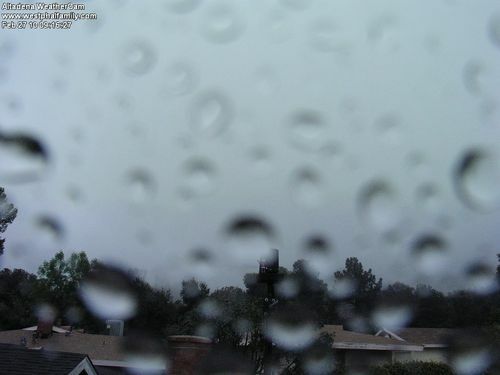 The Altadena Weathercam at 9 AM says it all! PERIODS OF HEAVY RAINFALL HAVE OCCURRED ACROSS THE RECENT BURN AREAS IN CENTRAL LOS ANGELES COUNTY SINCE 230 AM...WITH SEVERAL AUTOMATED GAUGES REPORTING OVER 1.00 INCH. ADDITIONAL BANDS OF HEAVY RAIN AND A SLIGHT CHANCE OF THUNDERSTORMS WILL CONTINUE TO SPREAD ACROSS THE WARNING AREA...WITH RAINFALL RATES EXCEEDING ONE HALF INCH PER HOUR AT TIMES. IF THUNDERSTORMS WERE TO DEVELOP...RAINFALL RATES UP TO 1.00 INCH PER HOUR WILL BE POSSIBLE. RAIN AT THESE INTENSITIES WILL LIKELY CAUSE FLASH FLOODING AND DEBRIS FLOWS IN AND AROUND THE RECENT BURN AREAS. A FLASH FLOOD WARNING FOR A RECENT BURN AREA MEANS THAT FLOODING AND DEBRIS FLOWS ARE IMMINENT OR OCCURRING. RESIDENTS LIVING IN OR IMMEDIATELY DOWNSTREAM SHOULD TAKE IMMEDIATE PRECAUTIONS TO PROTECT LIFE AND PROPERTY. QUICKLY MOVE AWAY FROM THE BURN AREA ONLY IF IT IS SAFE TO DO SO...OTHERWISE SHELTER IN PLACE AND MOVE TO A SECOND STORY OR THE HIGHEST LOCATION IN YOUR HOME TO STAY OUT OF THE PATH OF FAST-MOVING WATER AND DEBRIS FLOWS.